It’s always welcome to catch Matthias Schoenaerts in a film, and his latest, “The Mustang”, affords him one of his better roles. But, while his performance is often strong and charismatic, the film has story and execution problems that lessen the impact. 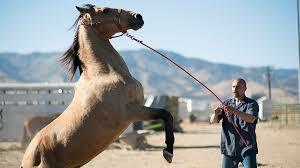 Directed by Laure de Clermont-Tonnere, from a script by Mona Fastvold, Brock Norman Brock and herself, it was inspired by a documentary about a federal prison program that allows inmates to train wild horses. The opening shows the roundup of the herd. Frightened by a hovering helicopter, they try to escape, but are captured when they run into areas where waiting workers close the fences on them. We next see Roman, played by Schoenaerts, in an interview with a psychiatrist, played by Connie Britton. He shows a barely contained hostility, and only wants to leave the session. A silent loner, powerfully built, the other inmates give him a wide berth. The psychiatrist is concerned that, if released on parole, he seems so indifferent to his future, and refers him to the horse training program. He chooses a mustang that seems the most resistant to being locked in, constantly kicking at the stall door. He gives the horse the name “Marcus”. Much of the film is about how he breaks the horse, helped by the coaching of the veteran leader of the program, played by Bruce Dern. The goal is to tame the animal so that it will be bought at auction, which is only a few weeks away. Slowly, reluctantly, Roman adapts to the pressure, and makes progress; the mustang eventually accepts the saddle, and Roman’s command. Interspersed are two other story lines. In the stronger one, he is visited by his daughter, played by Gideon Adlon, who is anything but affectionate. She rarely visits, but now wants him to sign over his house, which she wants to sell. She is pregnant, and wants to marry the father. Slowly, the backstory of Roman’s crime is revealed, and how it relates to his daughter’s hatred of him, and his guilt. 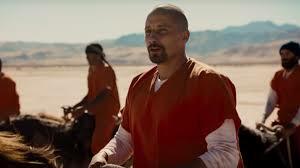 In the second, Roman’s relation to the other prisoners is seen to be changing, but in ways not entirely clear. There is an unspoken conflict between the white and black factions. Finally, violence erupts, and Roman, though uninjured, suffers deep emotional pain from it. Balancing these separate themes proves a problem for the filmmakers, and it muffles the film’s impact. This might not have been a major problem if the dominant story line was more involving. To be blunt, the man and horse love-fest is a little tired, and little happens that we haven’t seen before. It’s a beautiful animal, nice to look at, but the slow development of their affection is mostly done by them looking into each other’s eyes. Not a whole lot of action in that. Only one shot – showing the discouraged Roman, seated, with Marcus gently placing his head against his face – makes for a memorable image. In fact, Schoenaerts doesn’t seem to come alive except in the scenes with his daughter. He finally opens up to her, tearfully, and we sense that there is real dramatic movement taking place. Will she forgive him? But the filmmakers, rather unwisely, choose to merge that question into the climactic scene at the auction. Marcus reverts to his former wildness, with devastating results for Roman’s future. This leads to Roman’s final act of sacrifice, where he reveals just how important freedom is to him. That scene is nicely set up, giving Dern his one spotlight moment in an otherwise cliched role. But it doesn’t quite work. The final shot, which is meant to evoke a sense of redemption for Roman, instead shows how flimsily the film was constructed.